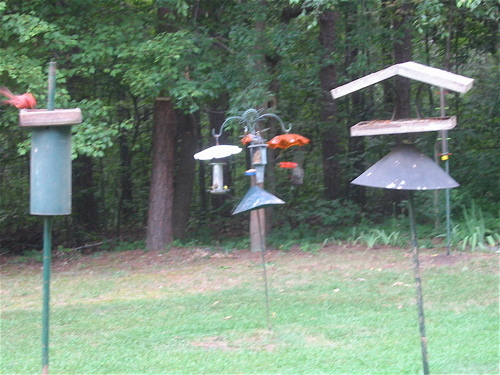 Regardless of what the groundhog says…hummingbird feeders! What’s wrong with this picture? It hasn’t been photo-shopped or altered, and it’s certainly a real hummingbird. Oddly enough, these tropical migratory birds have been known to overwinter on several occasions. Nobody really knows why they would even want to stay and brave such harsh weather, especially when all their buddies head south… a mere 3 to 5 thousand miles! This nectar can’t be all that special? 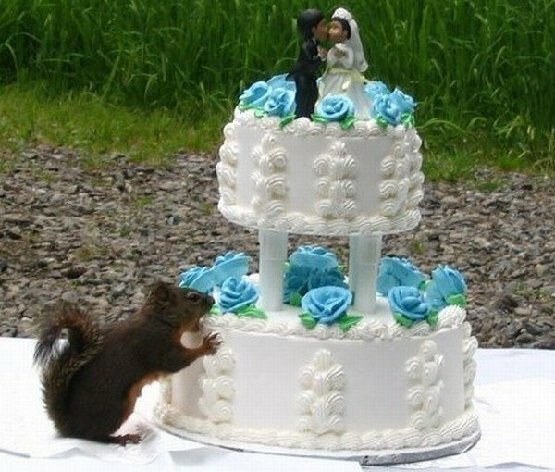 On Cape Cod, there was even a big news story last year, where one lonely Ruby Throated was made famous! 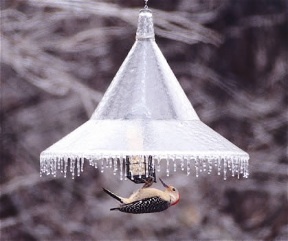 A few residents were hanging heat lights over their hummingbird feeders to keep nectar from freezing! Another reported bird made headlines in North Carolina too. 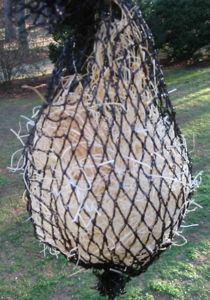 Regardless of what Punxsutawney Phil decides, hummingbird feeders should be out, filled and ready before the birds actually make their way to your neck of the woods. Project Ruby Throat and some other sites even track the great migration, with reports of the first birds arriving from the south and their directional sprawl north, east and west. Since hummingbirds are so darn territorial, it might be a good idea to start thinking about adding an additional feeder this year, especially if you’d like to see more of the buzzing antics in your yard. If you hosted them last year… the same ones will likely return! And if you’ve never made your own nectar… this is definitely the season to start! We think the birds prefer the home made solution over commercial mixes any day. NO red dye needed. The recipe is so simple, it’s table sugar (cane sugar only) and water… that’s it! Check out some suggested plantings (along with the recipe) that will help lure the birds as well. 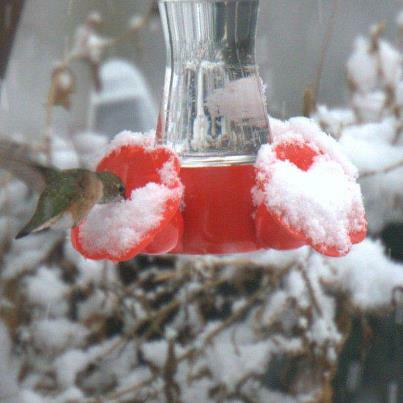 And make a vow to keep feeders fresh this year, hummingbirds may not return to a feeder that has spoiled nectar. Every two to three days nectar should be changed in the height of summer and extreme temps. 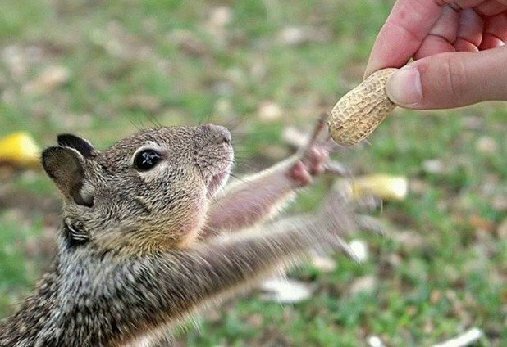 You may not want to fill the feeder all the way unless most of the nectar is being used in between cleaning and filling. After viewing some related videos on YouTube, it can be said that crows are really extremely smart birds! A link to the video mentioned in this review is included, but the case of the fisherman’s thief was really entertaining as well! In the depths of winter 2012, this compulsively watchable video of a crow sledding down a roof in Russia on jar tops went viral, sparking debate among its almost 700,000 viewers around the world. Crow expert and author John Marzluff received it from enthusiastic viewers from across the United States and several different countries around the world. And if not proof enough, check out this great PBS video on ravens and two classic examples of their intelligence. In GIFTS OF THE CROW: How Perception, Emotion, and Thought Allow Smart Birds to Behave Like Humans (Atria, February 5, 2013, $15.00), Marzluff, the preeminent researcher on crows, teams up with artist and fellow naturalist Tony Angell to offer an astonishing look at the little-known and largely under-appreciated intelligence of the birds of the amazing corvid family, which includes crows, ravens, and jays. Showing that these “bird brains” are actually quite sophisticated, Marzluff and Angell tell fascinating, true stories of surprising crow behavior, such as crows using tree bark to wind surf along ridge tops, tools to get food from hard-to-reach places that human babies can’t figure out, and, most surprising of all, giving gifts to people who help or feed them. Along with these and other amazing stories, the authors explain the engrossing, breakthrough science that accounts for this behavior, as well as arresting illustrations of the crow’s antics and anatomy. GIFTS OF THE CROW proves (beyond a doubt) that crows are highly intelligent, undeniably emotional, and much more similar to humans than we ever imagined. In fact, the authors reveal that crows have taken on seven key human characteristics: language, delinquency, insight, frolic, passion & wrath, risk-taking, and awareness. Their unusually large and complex brains, long lives, social lifestyles, and shared habitat with humans have led to crows evolving these human traits. With surprises on every page, Marzluff and Angell recount mind boggling, riveting stories of crows who, like humans, acknowledge their recently deceased, bestow gifts, seek revenge, warn of impending danger, recognize people’s and other creatures’ faces, commit murder, dream, play tricks, design and use tools, and work together to accomplish tasks. 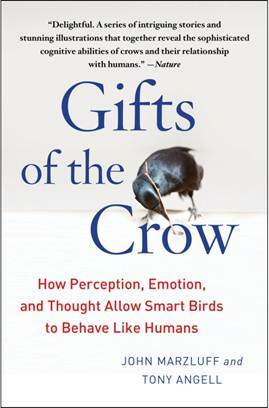 Exciting and conversation-changing, GIFTS OF THE CROW reveals new discoveries about crows’ intelligence, behavior, and relations with people and other animals, as it provides a fresh theory about how crows have assumed human traits—and what their behavior tells us about ourselves. · What makes corvids so much more like humans than other species, such as the eagle, whale, or bear? · The symbiotic relationship between crows and humans: how they adapt to us and learn from us and what we can learn from them? · Why crows over the years have been considered clever, from Aesop to Dickens to Poe to today, and why the term “bird brain” is not an insult but a compliment? · Why it is important and valuable to study the sophistication of crows from both a scientific and artistic perspective? · How these findings about the amazing abilities of crows should influence the way we, as humans, go about protecting and preserving these and other sentient beings. John Marzluff, Ph.D., is Professor of Wildlife Science at the University of Washington. The author of four books and more than one hundred scientific papers on various aspects of bird behavior, his research has been the focus of articles in the New York Times, National Geographic, Audubon, Boys Life, The Seattle Times, and National Wildlife. PBS’s NATURE featured his raven research in its 2001 production “Ravens,” and featured his crow research in 2010 with the documentary film, “A Murder of Crows.” John has been a guest on NPR’s Diane Rehm Show, the Jay Thomas Show, and Morning Edition. How did Dovecote Birdhouse Get Its Name? Dovecote: A shelter with nest holes for domesticated pigeons. Pigeons…huh? The term actually stems from England, where folks domesticated and kept (and maybe still do?) pigeons. Large housing with multiple nesting sites were used for shelter. Can’t say I know of anyone currently who domesticates and keeps pigeons as pets… but hey, all things are possible! 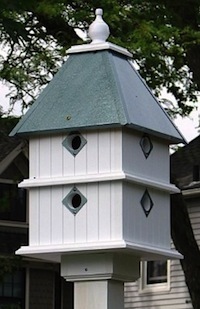 A modern day dovecote birdhouse like these shown here are appealing to some of our native cavity nesters. Purple Martins use a type of multi compartment house, as will tree swallows. 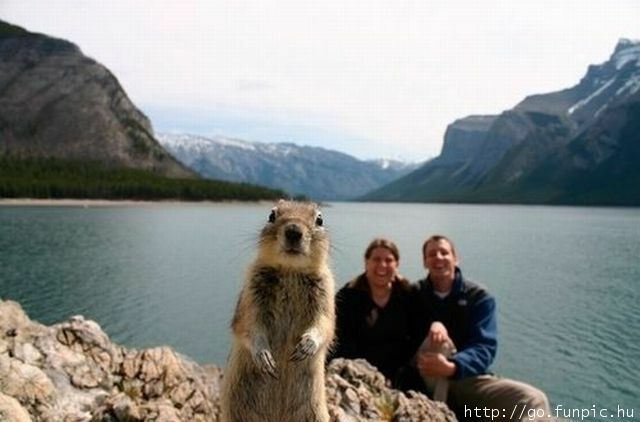 Bluebirds… nope. Chickadees and titmice may nest in these accommodations, woodpeckers and nuthatches-probably not. Cardinals, robins and jays don’t use houses for nesting, they use shelves, mature trees and shrubs, and some odd spots like a light fixture on a porch, (robins anyway). The strange thing is, European starlings and house sparrows will definitely take up residence… and Europe is from where this type of bird house originated. But, these birds are considered less desirable, in fact hated by some! Sparrow traps are even popular among bluebird and martin landlords. Some may cringe at this, as sparrows are the only birds they’re able to attract. They do have a nice song, but they’re really not sparrows… they’re finches, Weaver Finches to be exact. Our native songbirds like bluebirds and tree swallows were at one time in severe decline due to sparrow and starling’s increased populations. And man, they’re downright mean birds! That might sound silly, but by natural instinct for territory and dominance, sparrows and starlings will kill adult and babies of both bluebirds and tree swallows… and anything else it wants to overtake a nesting cavity. Pecking them to death, and removing eggs from nests are two of the biggest ways they succeed. 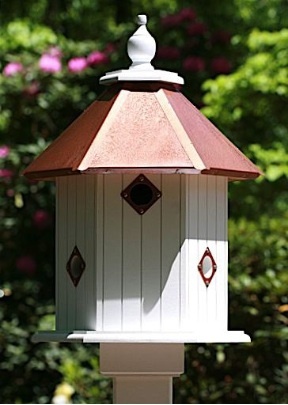 If you admire the dovecote style birdhouse (and many do) please don’t let sparrows take hold. 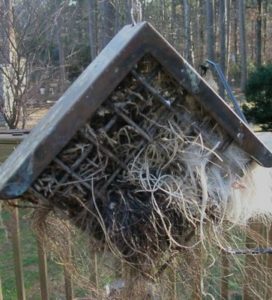 Their nests are easily identifiable, a dome shaped mess of a nest, with grasse s, trash, strings and the occasional , “I don’t know what that is?” Remove sparrow nests immediately, and if they start building again-remove the nest again. Eventually they should give up. 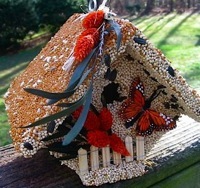 These stunning birdhouses will grace the landscape with elegance for many seasons. Although they look like wood, the body is actually vinyl/PVC, and won’t deteriorate, won’t fade, warp, crack or split! These fine English Dovecote Birdhouses are crafted in the USA and built to last! 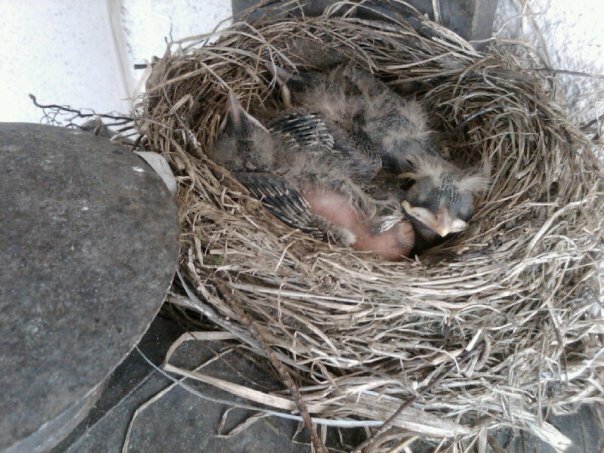 For more info on cavity nesting birds, egg and nest identification, and to validate the this information, please visit www.Sialis.org. 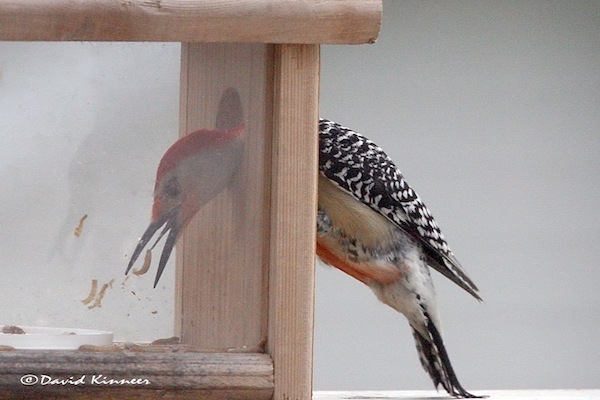 A wealth of information may be found, including suet recipes, great photos, resources, and much more! birdhouse chick	Comments Off on How did Dovecote Birdhouse Get Its Name? Hey… Today is National Bird Day! American Anti-Vivisection Society sponsors National Bird Day! Take the short quiz & get the feathered friends screen saver! Birds are fascinating animals. They can be found in every color imaginable. Most fly, some swim. A few have wings that span several feet, while others only inches. The song of some can rival the beauty of a seasoned musician. And their courtship displays can be so elaborate, they can turn any girl’s, er, bird’s head. Like dogs and cats, birds are sentient creatures, but some turn a blind eye towards these animals, as the majority have little, if any, legal protection. AAVS has worked hard on their behalf, and we still do. In fact, AAVS was successful in our efforts to persuade the U.S. Department of Agriculture to include at least some birds under the protections of the Animal Welfare Act, and we continue to fight for the regulations that will help ensure their humane care and treatment. We know you appreciate birds just as much as AAVS. There are 9,800 bird species…and every one of them is special and unique. But how much do you know about birds? Take our quiz and find out. Get every answer correct and you’ll win a free screen-saver that celebrates our feathered friends! Who are they? AAVS works to end the use of animals in science. May your New Year be filled with much happiness and good health!